1. Should I get a rectangular or round trampoline? 2. Is the thickness of trampoline frames important? 3. What size trampoline should I get? 4. After making my purchase, how many days afterwards should I expect to receive my trampoline? 5. How important is a safety enclosure net? 6. What's the purpose of a trampoline pad? 7. Can I lose weight and burn calories with a trampoline? 8. What type of warranty do you offer on your trampolines? 9. Is it difficult to put a trampoline together? Should I get a rectangular or round trampoline? Rectangular trampolines springs work at different rates, giving the jumper a quicker response, resulting in a more powerful lift. Due to these characteristics, rectangular trampolines are designed more for experienced jumpers. As for round trampolines, all the springs work at the same rate, thus giving a more even, softer and more stable bounce, suitable for inexperience and children of any age and ability. In recent years, round trampolines have gained the most popularity among all types of trampolines, combining for excellent work-out, health benefits and fun for children and families of all ages. Is the thickness of trampoline frames important? Yes, the frame is the most important part of the trampoline. The thicker the frame, the more weight that trampoline can endure and the durability that that trampoline will withstand over the years. A basic trampoline comes with a frame thickness of 1.2mm. A quality round trampoline that you can use for years has to have a frame at least 1.5 to 1.8mm. However, a quality rectangular trampoline should have a frame that's at least 2.0 to 2.5mm thick. 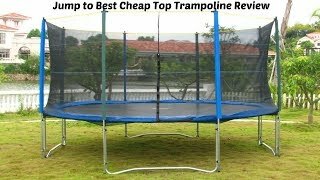 When considering trampoline size, consumer should consider who is going to use the trampoline and will the trampoline be too small for the jumper in 2-3 years. Keep in mind that a 14' round trampoline has 42% more jumping area than a 12'model trampoline, making it more suitable for children as they grow. A customer service professional should be available to help assist you with this decision, so click on the chat link for any assistance. After making my purchase, after how many days afterwards should I expect to receive my trampoline? As soon as your purchase is made, if you choose ground delivery, your trampoline should be shipped within 2-3 business days and arrive to your location within 7-10 days. How important is a safety enclosure net? Safety enclosure nets are excellent for inexperience jumpers. The safety enclosure net surrounds the entire trampoline. These safety enclosure nets should be at least 6 feet high, from the of the trampoline, to prevent high bouncers from jumping over the . The support poles should be highly padded to prevent accidents. If the trampoline isn't situated at least 4 feet from grass or play bark, a safety enclosure net is absolutely recommended. What's the purpose of a trampoline pad? Trampoline pads should fit snugly against the frame, with a skirt hanging down. Quality trampoline pads should be closed cell polyethylene foam, which is waterproof. The end of the trampoline pad should be encased all around by UV resistant, reinforced PVC as this improves the durability of the pad. Can I lose weight and burn calories with a trampoline? Trampolines are an excellent way to lose weight and burn calories, while at the same time, have lots of fun. Fitness trainers suggest jumping on a trampoline at least 30mins a day and you'll notice a huge difference in your cardio and physical condition after 2-3 weeks. Keep in mind that a lot of gymnasts use trampolines to help them build and maintain endurance and stay in shape. What type of warranty do you offer on your trampolines? Please refer to our Terms and Conditions/Warranty section for answer. Is it difficult to put a trampoline together? Trampolines are extremely easy to put together. Our trampolines come with instruction manuals and should take 30-45 minutes for first time installers.